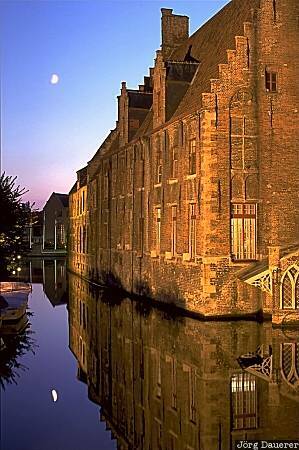 Moon and the facade of a flood-lit house which is reflected in one of the channels of the city of Bruges at the blue hour after sunset. Bruges is in Flanders in the north west of Belgium. This photo was taken after sunset on a Sunday in September of 1997.